Take Exit #17 at Gastonia onto 321 North. Continue approximately 70 miles on Route 321 North to Blowing Rock. When you enter Blowing Rock, continue on 321 by-pass. You will pass Woodlands Barbecue, Pizza Hut and the Outback Steakhouse on your left. Continue through the first traffic light at the Scotchman (right)/BP Station (left) and through the next traffic light. At the 3rd traffic light, turn right onto Possum Hollow Road (The Shoppes on the Parkway will be on your left.) See Possum Hollow Road directions below. Take Exit 321 onto 321 North. It is approximately 45 minutes to Blowing Rock from there. When you enter Blowing Rock, continue on US Highway 321 by-pass. You will pass Woodlands Barbecue, Pizza Hut and the Outback Steakhouse on your left. Continue through the first traffic light at the Scotchman (right)/BP Station (left) and through the next traffic light. At the 3rd traffic light, turn right onto Possum Hollow Road (The Shoppes on the Parkway will be on your left.) See Possum Hollow Road directions below. As you enter Boone on Hwy 421 stay in the left lane. At the intersection of 421 and Hwy. 105 Extension, turn left onto 105. At the second traffic light on 105 (BBT/Wendy's/Exxon Station) turn left (South) Highway 321 (Blowing Rock Road). Continue south on 321 out of Boone toward Blowing Rock. After passing Tweetsie Railroad and going under the Blue Ridge Parkway Bridge, you will come to a traffic light. The "Tanger Shoppes on the Parkway" will be on your right. Turn left onto Possum Hollow Road. See Possum Hollow Road directions below. See Possum Hollow Road directions below. -	Turn LEFT onto Sunset Drive. Continue .2 miles to the stop sign. - Turn LEFT onto Goforth Road and continue on Goforth Road until you come to the 15 mph speed limit sign; you will see the entrance to the BRCC on your right. BUSES AND OTHER LARGE VEHICLES, OR VEHICLES TOWING TRAILERS: DO NOT TAKE GOFORTH ROAD FROM THE HIGHWAY 321 BYPASS. 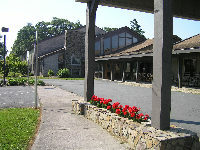 THE DIRECTIONS OUTLINED ABOVE ARE THE BEST AND SAFEST ROUTES TO THE BLOWING ROCK CONFERENCE CENTER. If you are coming on a chartered bus, please call us in advance for instructions.